ASCOD MMBT (Medium Main Battle Tank), version of the ASCOD II tracked combat vehicle. 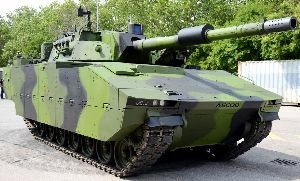 With a total weight of 42 tons, it is equipped with a modern 120 mm manned turret armed with a 7.62 mm coaxial machine gun. The main 120-mm smoothbore gun can fire standard NATO tank ammunition and it has a computerized fire control system. The commander and gunner receives a stabilized image from day/thermal imaging sights with a laser range finder.